Agra is legendary as the home of the Taj Mahal, the immortal marble mausoleum and an ode to love. One of the most famous sights in the world, the Taj Mahal attracts several thousand visitors each year to visit it. Agra is therefore also home to some pretty luxurious and comfortable hotels, some of which overlook the Taj. Read on to explore your best options for staying here. Located just 600 metres away from the iconic Taj Mahal, the Oberoi Amarvilas is one of the most beautiful luxury getaways in India. Every single room has a view of the Taj Mahal, and are furnished with Mughal detailing inn the furnishings, covers and upholstery. The grounds of the hotel are vast, including terraced lawns, fountains, limpid pools and romantic pavilions. The Wyndham Grand hotel is built on a sprawling 18 acres of land, and the architecture reflects the arches and ceilings of the Mughal era. With Agra’s largest swimming pool and other water-based facilities such as a spa, jacuzzi, sauna and even a submerged pool bar, Wyndham Grand offers a relaxing and pampered stay. The hotel has 160 rooms, including suites and presidential suites, all equipped with state-of-the-art facilities designed to make a stay easier and more opulent. India’s only winner of the famous Aga Khan Award, the ITC Mughal is steeped in Mughal details which make it an outstanding piece of architecture in its own right. 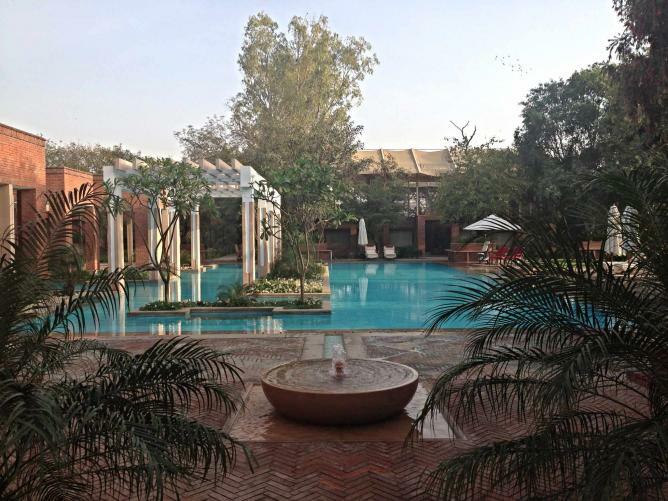 Its carefully-landscaped garden is designed along the lines of Mughal gardens, with slim water channels, lush flowering trees, and an abundance of fruit trees. The suites are all inspired by famous Mughals, including notable personages such as the Mumtaz (Mahal) suite, the Nur Jahan suite, and the Tansen suite. Crafted down to the last, most exquisite detail, this is any history aficionado’s dream come true. 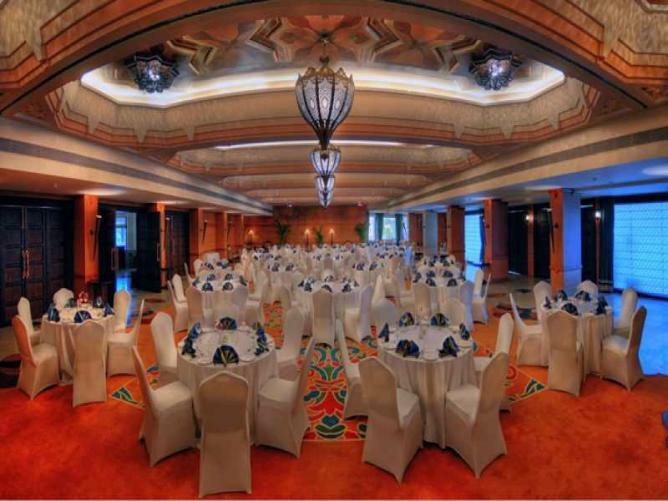 The mainstay of distinguished persons such as Prince Aga Khan and Dilip Kumar, the Grand Imperial has a rich history to offer and entertain its visitors. There are 30 rooms in total, including several suites; all of these have terracotta-coloured walls and opulent decorations from the original hotel (known then as The Imperial). The spa offers traditional Ayurvedic treatments, sure to help with a relaxing and luxurious rest after a day’s sightseeing. A boutique hotel in the heart of Agra, the Hotel Atulyaa Taj prides itself on its sleek design and comfortable interiors. 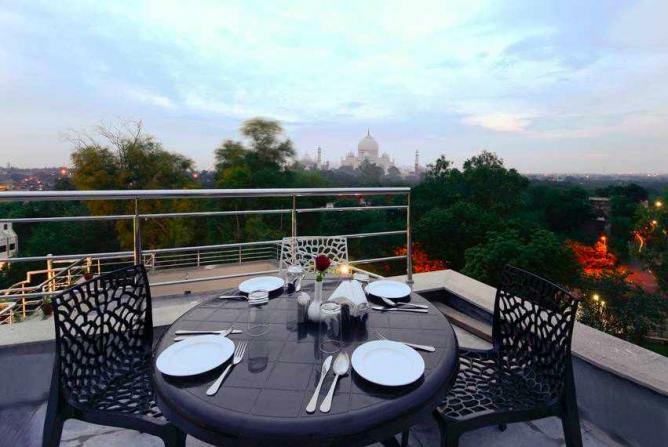 There’s a rooftop garden restaurant known as The Exotica, with views of the Taj. The restaurant is located next to a swimming pool where you can relax. The rooms are upholstered in dark, warm shades, and while they aren’t quite as opulent as some other locations on the list, they are pretty, spacious and have all the mod-cons.